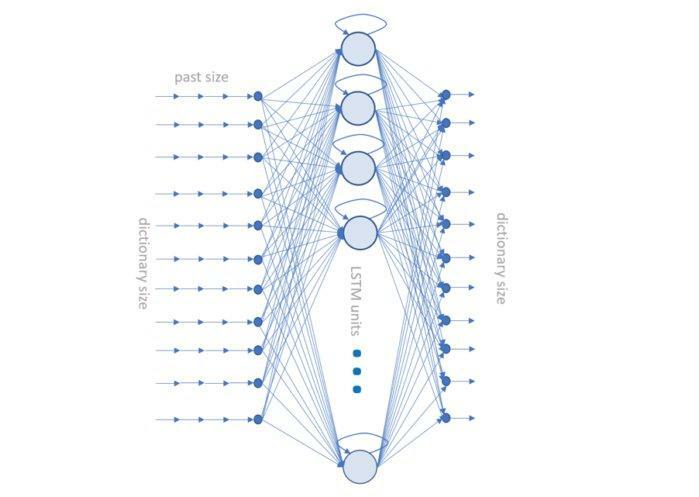 LSTM recurrent neural networks can be trained to generate free text. Let’s see how well AI can imitate the Bard. Who can write like Shakespeare? Or even just spell like Shakespeare? Could we teach AI to write like Shakespeare? Or is this a hopeless task? Can an AI neural network describe despair like King Lear, feel jealousy like Othello, or use humor like Benedick? In theory, there is no reason why not if we can just teach it to. From MIT’s The Complete Works of William Shakespeare website, I downloaded the texts of three well-known Shakespeare masterpieces: “King Lear,” “Othello,” and “Much Ado About Nothing.” I then trained a deep learning recurrent neural network (RNN) with a hidden layer of long short-term memory (LSTM) units on this corpus to produce free text. Was the neural network able to learn to write like Shakespeare? And if so, how far did it go in imitating the Bard’s style? Was it able to produce a meaningful text for each one of the characters in the play? In an AI plot, would Desdemona meet King Lear and would this trigger Othello’s jealousy? Would tragedy prevail over comedy? Would each character maintain the same speaking style as in the original theater play? I am sure you have even more questions. So without further ado, let’s see whether our deep learning network could produce poetry or merely play the fool. Recurrent neural networks (RNN) have been successfully experimented with to generate free text. The most common neural network architecture for free text generation relies on at least one LSTM layer. To train our first Shakespeare simulator, I used a neural network of only three layers: an input layer, an LSTM layer, and an output layer (Figure 1). The network was trained at character level. That is, sequences of m characters were generated from the input texts and fed into the network. Each character was encoded using hot-zero encoding. This means that each character was represented by a vector of size n, where n is the size of the character set from the input text corpus. The full input tensor with size [m, n] was fed into the network. The network was trained to associate the next character at position m+1 to the previous m characters. The input layer with n units would accept [m, n] tensors, where n is the size of the character set and m the number of past samples (in this case characters) to use for the prediction. We arbitrarily chose m=100, estimating that 100 past characters might be sufficient for the prediction of character number 101. The character set size n, of course, depends on the input corpus. For the hidden layer, we used 512 LSTM units. A relatively high number of LSTM units is needed to be able to process all of these (past m characters - next character) associations. Finally, the last layer included n softmax activated units, where n is the character set size again. Indeed, this layer is supposed to produce the array of probabilities for each one of the characters in the dictionary. Therefore, n output units, one for each character probability. Figure 1. The deep learning LSTM-based neural network we used to generate free text. ninput neurons, 512 hidden LSTM units, an output layer of n softmax units where n is the character set size, in this case the number of characters used in the training set. Notice that in order to avoid overfitting, an intermediate dropout layer was temporarily introduced during training between the LSTM layer and the output dense layer. A dropout layer chooses to remove some random units during each iteration of the training phase. The dropout layer was then removed for deployment. The network was trained on the full texts of “King Lear,” “Othello,” and “Much Ado About Nothing,” available from The Complete Works of William Shakespeare website, a total of 13,298 sentences. The neural network described above was built, trained, and deployed using the GUI-based integration of Keras and TensorFlow provided by KNIME Analytics Platform. The workflow to build and train the network is shown in Figure 2. The workflow to deploy the network to predict the final text, character by character, is shown in Figure 3. These workflows have been copied and adapted from the workflows implemented in the blog post by Kathrin Melcher, “Once Upon a Time … by LSTM Network,” where a similar network was trained and deployed to generate free text, having trained on texts from the Grimm’s fairy tales. Both workflows are available and downloadable for free from the KNIME EXAMPLES server under 04_Analytics/14_Deep_Learning/02_Keras/11_Generate_Fairy_Tales. In Figure 2, the brown blocks (nodes) in the Define Network Structure section (top left) build the different layers of the neural network. The data are cleaned, standardized, reshaped, and transformed by the nodes in the Preprocessing and Encoding section (lower left). Finally, the training is carried out by the Keras Network Learner node and the network is stored away for deployment. The deployment workflow in Figure 3 reads and uses the previously trained network to predict free text, one character after the next. Figure 2. The training workflow trains a neural network (62 inputs -> 512 LSTM -> 62 outputs) to predict the next character in the text, based on the previous 100 characters. Training set consists of the texts of “King Lear,” “Othello,” and “Much Ado About Nothing” by William Shakespeare. Thus, the network should learn to build words and sentences in a Shakespearean style. Figure 3. The deployment workflow takes 100 characters as the start and then generates text character after character in a loop, until 1,000 characters are generated, making the full, final Shakespeare-like text. Here are some results, after training the network for 50 epochs on the entire data set—the three selected theater plays—using 100 past characters for the input tensor and recursively generating 1,000 new characters. Let’s start with 100 characters from a dialog between Othello and Desdemona (in red) and then see how our network would continue (in plain text). I am a man a worm. That pirchas will be well. Turn a man, I think, besoou. I would not be threaten dispatch. I will grife you be faster’d! And that the Moor is defective in the letter! That have to lost the boy look to’t. While Desdemona disappears from the dialog, a few minor characters from “King Lear” (Gloucester, Regan, and Oswald) trickle into the scene. We have created other free texts starting from different lines in the three plays, and it is interesting to notice that characters from the tragedies “Othello” and “King Lear” mix often, while characters from the comedy “Much Ado About Nothing” seem to be more self-contained. The text is generated using words from Shakespearean English and its characteristic complex sentence structure. Not all sentences make perfect sense, but most seem to. Notice also that minor characters are assigned shorter dialogs, while Othello and Cassio, in this example, get the longest speeches—as it should be. Let’s use the first 100 characters (again in red) to trigger a new scene. Here I introduced the keyword “SCENE,” the place, the involved characters, and the name of the first character to speak. The neural network does the rest. That she will send back my messenger. I see the rust in the stocks. Creating a new scene proved to be a much harder task than continuing an existing one. Desdemona’s talk starts well, and it is consistent with the original play. However, I am not sure I can follow it to the end. But seriously, how useful is an AI engine that produces archaic English text? Can we somehow improve current English sentences with a touch of Shakespeare? Let’s feed our Shakespeare-trained network some modern text and see what emerges. So, what kind of everyday, modern text could do with a bit of Shakespearean improvement? A software license agreement? Let’s see how much more interesting the network can make the start of a license agreement (in red). As master compary, do not live in traitor. So many folds of save and honest. In her prophetic fairs of a little to presently at your powers; whereof I thank you, sir. Gloucester, I will prove upancy of his sport and first accuriors and guard and talking on the white. The words save, honest, thief, master, traitor, and deceive seem to fit the context. Notice also that the dialogue sprouting from the start text of the license agreement interestingly involves mainly minor, less tragic characters from the plays. We have reached the end of this experiment. We have trained a recurrent neural network with a hidden LSTM layer to produce free text. What have we learned? To sum up, the network was trained on the full texts of Shakespeare’s plays “King Lear,” “Othello,” and “Much Ado About Nothing.” It learned to produce free text in Shakespearean style. It just needed a 100-character initial sequence to trigger the generation of free text. We have shown a few different results. We started with a dialogue between Othello and Desdemona to see how the network would continue it. We also made the network write a completely new scene, based on the characters and place we provided. Finally, we explored the possibility of improving Modern English with Shakespearean English by introducing a touch of Shakespeare into the text of a license agreement. Interestingly enough, context-related words from Shakespearean English emerged in the free generated text. These results are interesting because real Shakespearean English words were used to form more complex sentence structures even when starting from Modern English sentences. The neural network correctly recognized main or minor characters, giving them more or less text. Spellings and punctuation were mostly accurate, and even the poetic style, i.e., rhythms of the text, followed the Shakespearean style. Of course, experimenting with data set size, neural units, and network architecture might lead to better results in terms of more meaningful dialogues.